This week's project is the corded petticoat. Today I have been ironing and cutting my fabric. For the skirt itself, I am using pink cotton shirting material, and have decided to go with a gored skirt that's waist is slightly bigger than me so I can have it on a drawstring (for the unexpected weight gains/losses--hopefully losses). As for measurements: I decided to make the waist 40 inches around (mine is 32, but my hips are 44, so i figured that was a good compromise and would allow drawstring action). 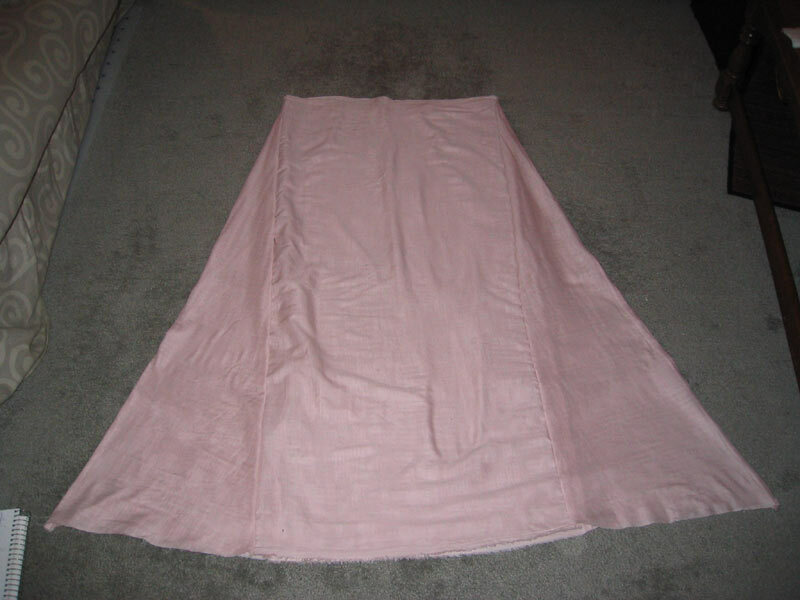 My skirt will be two rectangles for front and back (so 21 inches each--2x20 is the 40, and 1/2 inch seam allowance on each side) and 2 traingles on the sides to create the gored skirt effect. I decided to go with 100 inch circumfrence at the bottom of the petticoat based purely on a piece of ribbon i put on the floor and stood inside til I thought it was a good sized "halo" around my feet. 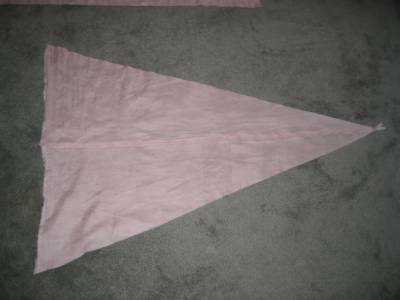 Since the waist will be 40 inches, i need to add 60 by the bottom, so my gored triangles will have a 30 inch bottom each. 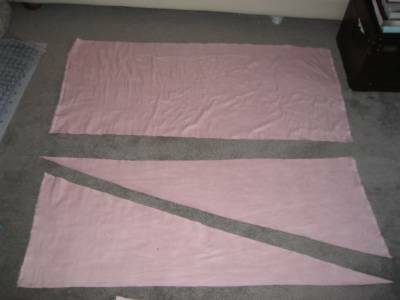 I folded my fabric on itself selvage to selvage, and cut 2 rectangles of 21 inches and two rectangles of 16 inches wide. 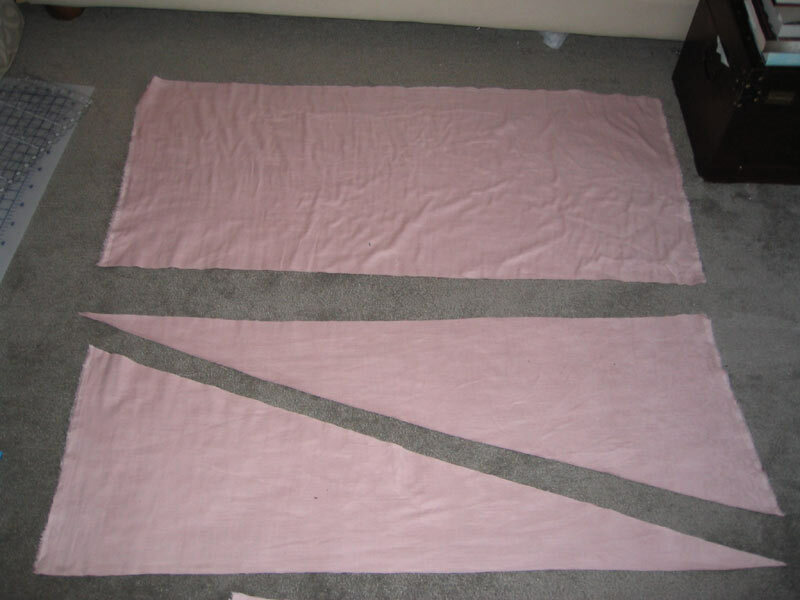 The 16 inch ones I cut in half diagonally to make 4 right angle triangles, which i will sew together. Tomorrow I will hopefully get out to find new rope/cording to provide the "body" of the skirt. Didn't do a dang thing on this over the weekend. Got a little distracted with spinning. Got to thinking about adding a spindle to a peasant costume. Yeah. Not so good on my part. Anyway, the skirt looks pretty cool. I'll be stealing your pattern, so thanks for the details!! !